Source: at about 46 minutes on this video from YouTube. Can this statement be considered true, and with what context (as affirmations derived from statistics are often oversimplified)? As vague as the claim is, there does not appear to be any angle to take in which it is true. Wages in the United States increased 4.20 percent in November of 2018 over the same month in the previous year. Wage Growth in the United States averaged 6.21 percent from 1960 until 2018, reaching an all time high of 13.78 percent in January of 1979 and a record low of -5.88 percent in March of 2009. 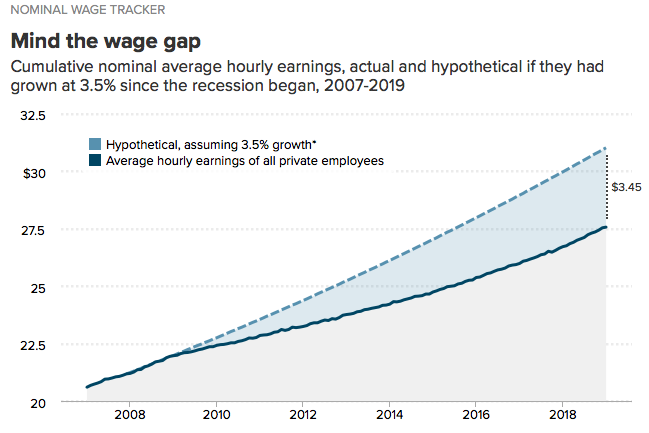 In the United States, wage growth refers to the yearly change in wages and salaries disbursements from government, manufacturing and service industries. 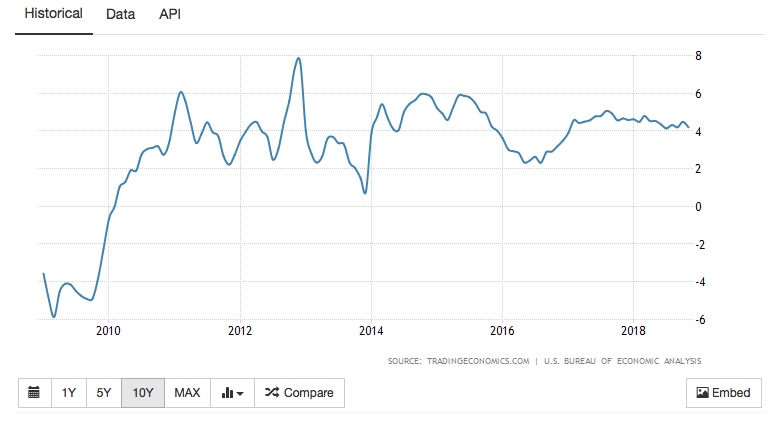 This page provides the latest reported value for - United States Wages and Salaries Growth - plus previous releases, historical high and low, short-term forecast and long-term prediction, economic calendar, survey consensus and news. 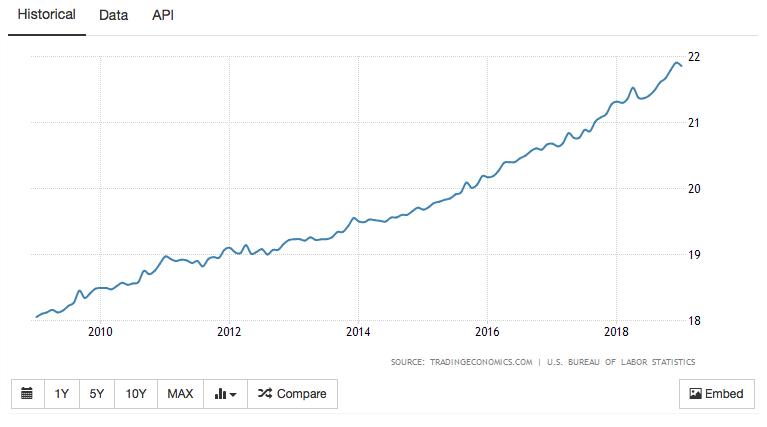 United States Wages and Salaries Growth - actual data, historical chart and calendar of releases - was last updated on February of 2019. Note that the above is addressing the "rising fastest pace" "in decades". United States Average Hourly Wages in Manufacturing –– Wages in Manufacturing in the United States decreased to 21.86 USD/Hour in January from 21.91 USD/Hour in December of 2018. Wages in Manufacturing in the United States averaged 9.33 USD/Hour from 1950 until 2019, reaching an all time high of 21.91 USD/Hour in December of 2018 and a record low of 1.27 USD/Hour in February of 1950. But that is, of course, quite different. Looking at the exact claim, we see it is not right either way. U. S. workers see fastest wage growth in a decade, but inflation takes a toll Washington Post, Heather Long, October 31, 2018. U.S. workers are seeing the largest nominal wage increase in a decade, the Labor Department reported Wednesday, as companies compete harder for employees than they did in recent years. Wages rose 2.9 percent from September 2017 to September 2018, according to the Labor Department’s Employment Cost Index for civilian workers, a widely watched measure of pay that does not take inflation into account. That is the biggest increase — not adjusted for inflation — since the year that ended in September 2008. Prices have risen significantly in the past year, especially for gas and rent. Adjusted for inflation, workers’ wages grew 0.6 percent over the year, making the increase the largest since 2016, according to the Labor Department. Wage growth has been steadily rising in the past year, according to the Employment Cost Index. From September 2016 to September 2017, wages and salaries rose 2.5 percent, the Labor Department said. Some have argued that companies were holding off on increasing wages because they were having to put more money toward benefits, but the Employment Cost Index also tracks benefits costs, and those have not risen as much as wages. Benefits grew 2.6 percent in the year ending September 2018 vs. 2.4 percent in the prior year. President Trump has taken credit for the strong economy and frequently likes to tout low unemployment and solid job growth when he is on the campaign trail ahead of the midterm elections. Economists say his policies deserve some credit for triggering faster growth, but unemployment has been falling steadily for eight years and wages have been inching higher. Trump campaigned heavily on bringing back blue-collar jobs. While manufacturing and other blue-collar professions are seeing some of the fastest job growth since the mid-1980s, pay is not rising. Most of the wage growth in the Employment Cost Index is coming from service-sector jobs. Pay in the “goods-producing sector” has actually slowed in the past year, notes Michael Pearce, senior U.S. economist at Capital Economics. 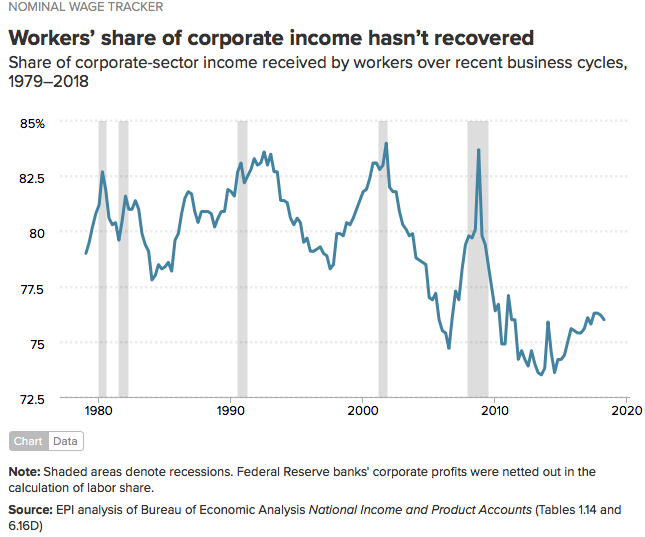 Pew research Center: For most U.S. workers, real wages have barely budged in decades, 2018. A crucial measure of how far from full recovery the economy remains is the growth of nominal wages (wages unadjusted for inflation). Nominal wage growth since the recovery officially began in mid-2009 has been low and flat. This isn’t surprising–the weak labor market of the last seven years has put enormous downward pressure on wages. Employers don’t have to offer big wage increases to get and keep the workers they need. And this remains true even as a jobs recovery has consistently forged ahead in recent years. There was a single small bump in wages, well below policy targets, over almost one decade, for a subset of "wages". As the starting point for this statistic was chosen to coincide with the start of the ongoing banking and financial crisis, this is misleading, on top of being blatantly false for the plural of 'decades'. It's a vague claim because it doesn't specify over what interval (monthly or yearly), real versus nominal, hourly wages or weekly wages. These are not annualized, so the numbers would need to be multiplied by 12 for an annualized rate. Year over year (Dec. 2017 to Dec. 2018), the report says that real hourly wages increased 1.1% and weekly wages increased 1.2%. According to this BLS link there was a peak year-over-year real hourly earnings increase of 4.8% in July 2008-2009. Similarly, there was a peak year-over-year real weekly earnings increase of 3.2% in July 2008-2009. So the claim is false at least on the basis of year-over-year, real wages, both hourly and weekly. But they also pointed out that this trend already started during the Obama era. Wages are on a steady raise since 2014, and that rate of increase didn't really change much after Trump moved into the White House. 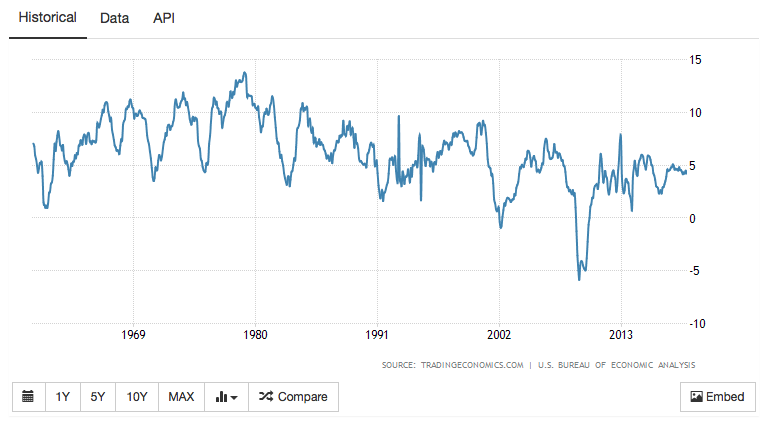 You can see the numbers on this chart from the Federal Reserve Bank of St.Louis. This was an increase of 8.5% over 4 years compared to the 1.1% over 2 years Trump is boasting about. Now one might be able to find some truth in Trump's statement by cherry-picking the data or finding different ways to measure wage increases, but generally speaking the claim "fastest raise in wages since decades" is dubious. 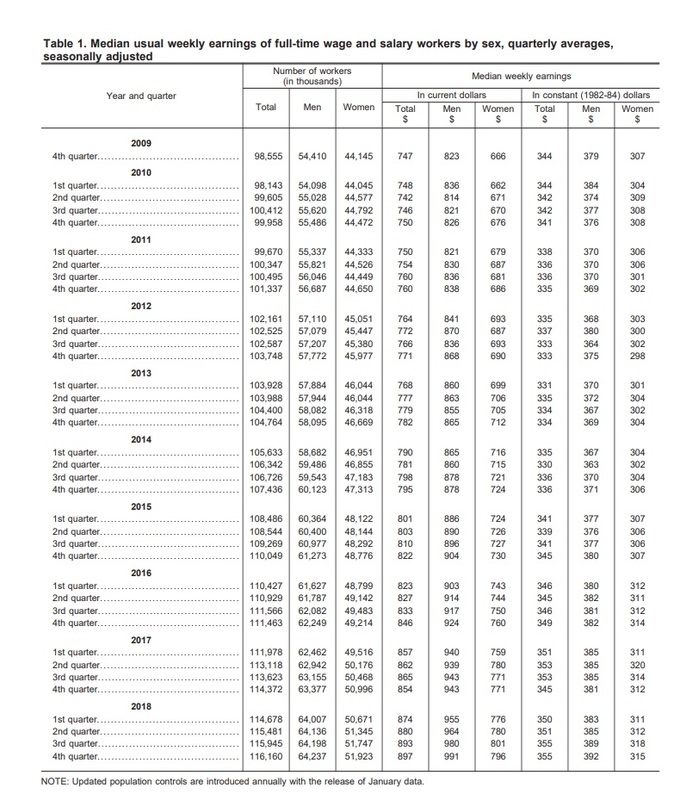 Table 1 in this BLS report shows that, when adjusted for inflation and seasons, the average weekly income overall was higher in 2017 and 2018 than in 2009-2016. It also shows the highest number of workers. This census.gov xls shows median household income from 1967 to 2016 (in 2016 dollars) and shows average income in 2016 was higher than any year since 1967. 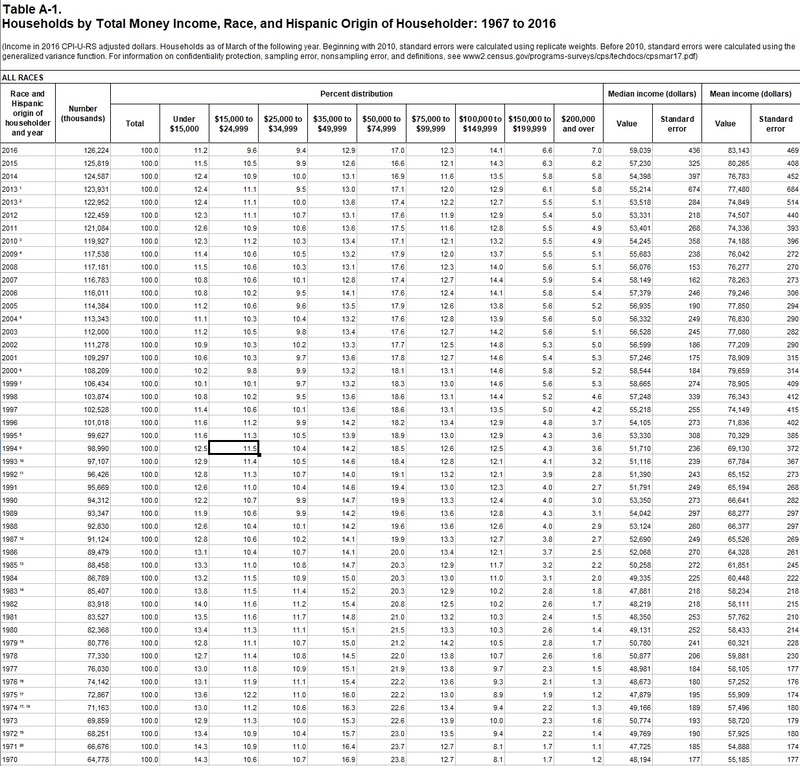 So the bls report shows weekly incomes decreasing from 2009 to 2014. The current wage increase begins in 2014. In the bls report, the year with the largest jump is 2015 (+$7.25). The census report doesn't quite match up. In it, the turn-around is in 2013. This is because of the time periods measured. This report shows the most recent valley from 2007 until the present. Either way, the current wage increase in the census report is around $5,708. This trend continues to the present (+2% is only $5,810), but still does NOT beat the largest jump in magnitude. 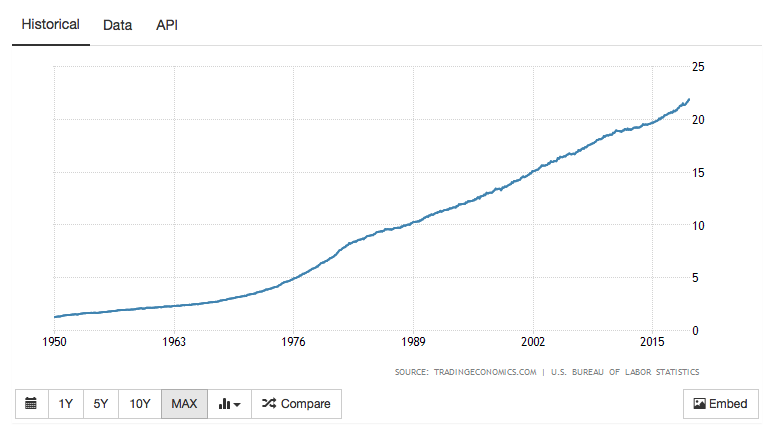 1993-1999 saw a jump of $7,549 from $51,116 to $58,665, which is $1,258/year on average. So our current increase isn't the largest (as of 2018 data). However, from at least this point of view, it seems to be the fastest ($1,452/year on average). In summary, wages are rising fastest only in the sense that we are in a multi-year period of wages consistently rising the fastest since at least 1969. That said, while 2018 was the highest paying year on record when adjusted for inflation, it was not the fastest growing year on record. That said, one must not get too literal when listening to Trump. When he says, "the best ever", hear "comparatively very good". And 2018 was undoubtedly a comparatively very good year for employment. Not the answer you're looking for? Browse other questions tagged united-states politics economics employment .